NAVAL STATION MAYPORT, Fla., Jan. 12, 2019 /PRNewswire/ -- The U.S. Navy commissioned USS Wichita (LCS 13) – the nation's seventh Freedom-variant Littoral Combat Ship (LCS) – at Naval Station Mayport today before a crowd including active-duty and veteran sailors. 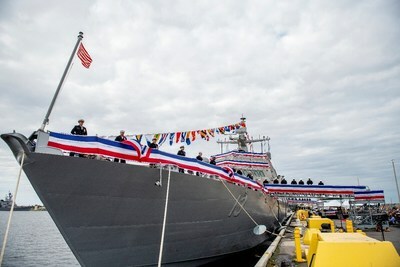 This milestone places the ship, built by the Lockheed Martin (NYSE: LMT)-led team into active service. Unique among combat ships, LCS is designed to complete close-to-shore missions and is a growing and relevant part of the Navy's fleet. "We are confident that LCS 13 will be what the Navy needs, when the fleet needs it, and we are proud to mark this day with her crew as the Navy welcomes its newest combat ship," said Joe DePietro, vice president, Small Combatants and Ship Systems, Lockheed Martin. "We remain focused on delivering these ships as quickly as possible with increasing capability and lethality." "Like a proud parent, I am so excited to share with you how awesome this ship really is," said LCS 13's Commanding Officer, Commander Nathan Rowan. "People ask me about Littoral Combat Ship. Is it a new cruiser or destroyer? Actually it's neither. It's an entirely new category of warship. The LCS packs quite a hefty punch for such a small package." There are seven ships in various stages of production and test at Fincantieri Marinette Marine in Wisconsin, where the Freedom-variant LCS is built. The next Freedom-variant in the class is LCS 15, the future USS Billings, slated for delivery this spring. "We consider it a privilege to support the men and women who will sail this great ship, protecting the United States and our allies," said Jan Allman, President and CEO of Fincantieri Marinette Marine. "On behalf of the two thousand individuals that crafted the LCS 13, we congratulate the U.S. Navy and the outstanding crew of the USS Wichita." Fincantieri is the leading western shipbuilder with a rich history dating back more than 230 years, and a track record of building more than 7,000 ships. Fincantieri Marine Group is the American subsidiary of Fincantieri, and operates three Great Lakes Shipyards: Fincantieri Marinette Marine, Fincantieri Bay Shipbuilding, and Fincantieri ACE Marine. Fincantieri Marine Group's more than 2,100 steelworkers, craftsman, engineers and technicians in the United States specialize in the design, construction and maintenance of merchant ships and government vessels, including for the United States Navy and Coast Guard.